"Dental assistants tend to be 'people people,'" said Ms. Elizabeth M. Crutchfield in June 13th Convocation Address. 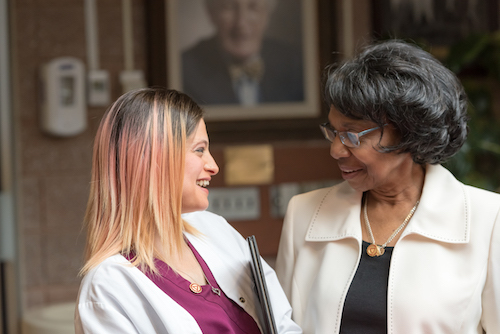 Ms. Crutchfield, Past Director of Stony Brook School of Dental Medicine's (SDM) Dental Assistant Program, knows this best: she worked diligently to establish the program 22 years ago alongside Ms. Carol Sloane, Assistant Dean of Clinic Operations. Since Ms. Crutchfield's time as a Dental Assistant at SDM in 1974, the SDM has had 300 graduates to date, welcoming the newest six graduates to its ranks: Ms. Gabrielle Elizabeth DiBiase, Ms. Cassandra L. Gravina, Ms. Lisbeth Hernandez, Ms. Joyce Lax, Mr. Venis A. Lewis II, and Ms. Rebekah Elizabeth London. Graduates of the Dental Assistant Program experience ten-months of full time didactic and clinic education. Clinical experience includes a clinical internship at SDM's Dental Care Center, and external rotations of Long Island State Veterans Home and Shinnecock Indian Health Center. "Graduates, you have been given a strong educational and clinical platform to build upon," said Ms. Crutchfield. "We hope you use this platform in your future professional growth, in your work, and your personal journey. After all, this is just the beginning." Following Ms. Sloane's Introduction of Candidates, Ms. Lisa Borzumato, Faculty, Dental Assistant Program, led the Presentation of Certificates, and Ms. Maria Nardiello, Faculty, Dental Assistant Program, led the Presentation of Pins. 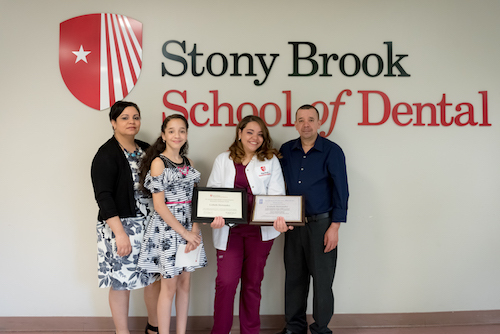 During the Presentation of Awards, Ms. Gravina was awarded the Long Island Academy of Odontology Award, Ms. London was awarded the Dental Assistant Program Radiology Award, and Ms. Hernandez was awarded both the Suffolk County Dental Society Award and the Restorative Technique Award. The class' Valedictorian, Joyce Lax, addressed the audience and her fellow classmates, highlighting the important role of dental assistants in oral health care: "the first hands-on dental professional that the patient sees is a dental assistant, and we set the tone for a good experience, helping the patient get the best treatment that we possibly can." Ms. Lax and her classmates each offered admirable stories of success leading to their graduation. For Ms. Lax, she had always been interested in dental medicine and saved money while working full-time to make her dream of attending SDM and switching careers a reality. 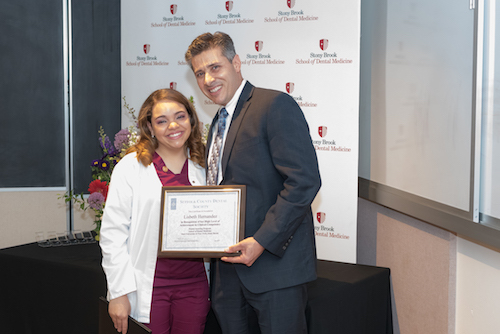 For Ms. Hernandez, a native of the Dominican Republic, graduation from the Dental Assistant Program followed a move to the United States in the 11th grade and learning English fluently over a short few years. Upon the conclusion of the ceremony, with closing remarks delivered by Dr. Dolores Cannella, Associate Dean for Education, the graduates, friends, family and members of the SDM community joined together to celebrate over refreshments. "It's such a good feeling to be graduating," said Mr. Lewis. Mr. Lewis plans to pursue further education while working full time with the goal of becoming a dental hygienist. Similarly, Ms. London plans to work towards a career in dental hygiene. 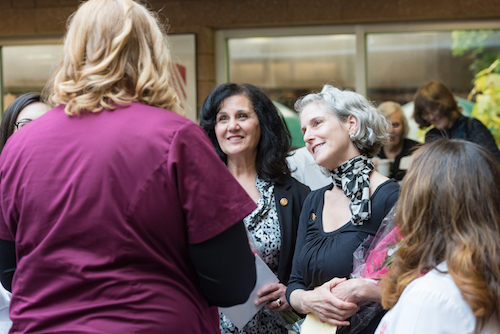 "We are proud of our Dental Assistant graduates and look forward to seeing where their careers will take them in the next chapters of their lives," said Dr. Cannella. 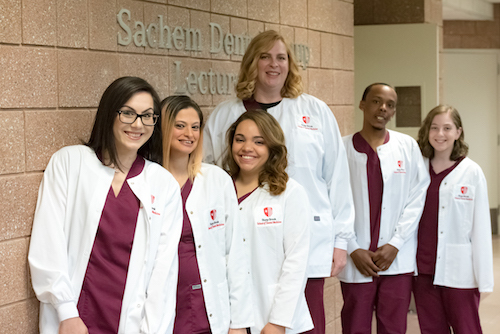 Stony Brook School of Dental Medicine's Dental Assistant Program's primary educational mission is to graduate caring, skilled dental assistants who are well-prepared to enter private practice through clinical, biomedical and behavioral knowledge. 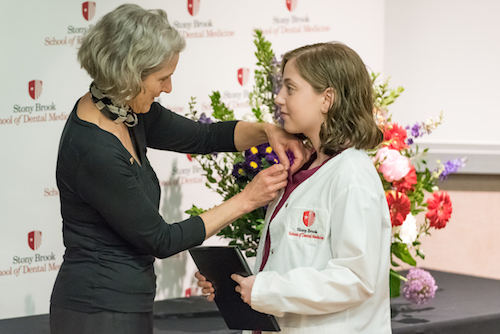 Stony Brook School of Dental Medicine remains dedicated to incorporating the latest in digital dentistry and looks forward to introducing online courses and digital badge opportunities to its Dental Assistant Program in the near future. To view more photos, visit us on Facebook.